Sixty years (and 700 million guests) later, Disneyland is marking its six-decade anniversary by hosting a summer-long party, called the Diamond Celebration, in sparkling style. The Disney folks are taking the diamond theme to the extreme by imbuing everything possible, down to Mickey’s costume, with glitter and shine. Disneyland’s Sleeping Beauty Castle will be draped in huge “diamonds,” and its towers will shimmer with 100,000 glass crystals. Diamond-themed surprises and details will feature throughout the temporarily iridescent park. But the big guns come out after the sun goes down in the form of three new and grandiose productions. First up is Main Street’s Paint the Night Parade, whose storyline has Mickey using his imagination (and some pixie dust) to concoct some dazzling dreams featuring beloved Disney and Pixar characters. It’s going to be an impressive illuminated spectacle with more than 1.5 million LEDs choreographed to a Disney soundtrack. (The music weaves in tributes to the original Main Street Electrical Parade, and, at the tip of Tinker Bell’s wand, there’s a light from that classic production.) There will be plenty of special effects, floats that dazzle, and performers and dancers in tech-heavy costumes throughout the Paint the Night Parade. After the Paint the Night Parade will be the new Disneyland Forever fireworks show. Disneyland’s typical pyrotechnic brilliance remains, but now its icons—including Main Street’s storefronts, the Matterhorn, and the “It’s a Small World” facade—will be bathed in digital projections that recall memorable moments in Disney films, like King Louie’s jazzy Jungle Book dance and Peter Pan’s flight over London. The show’s closing song will be Richard M. Sherman’s previously unreleased “Kiss Goodnight,” with vocals by Ashley Brown, who played Mary Poppins and Belle on Broadway. 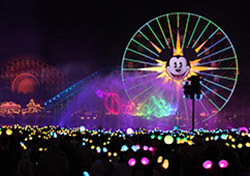 At California Adventure, a new rendition of the World of Color show has Mickey, along with Neil Patrick Harris (chosen for his “unique style of humor and charm,” according to a Disney press release), appearing in filmed sequences that take the audience on a tour of Walt’s magical mind. The grand finale is a wild musical tour of Disneyland’s attractions. It all plays out on a 1,200-fountain canvas of water that reaches 200 feet high at times. Dozens of lasers and high-definition projectors will provide color and light. Related: Quiz: How Well Do You Know Disney World? 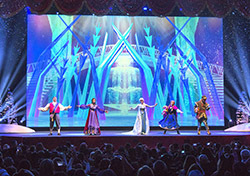 Besides these big three additions, which will run all summer long, Disneyland is using the occasion to roll out a few other offerings: Anna and Elsa star in a new Frozen show on the Fantasy Faire stage, the Matterhorn ride features new effects, and the Haunted Mansion has a new ghost. Book for at least two days. If you want to see all three nighttime spectaculars in their full glory, you’ll have to do it over two evenings in the two separate parks. Also, the new fireworks-and-projection show is meant to be seen from different locations throughout Disneyland, so seeing it on multiple nights will mean you can vary your vantage point. Use FastPass. You’ll be able to use FastPass to access reserved viewing areas for the World of Color show. You can also use this ingenious first-in-line ticket feature on select attractions so that you’ll have more time to fit everything in. Join in. A daily “Diamond March-Along” will go down Main Street, with the Disneyland Band and characters in their sparkling costumes. Follow along the procession—its finale will be a rousing sing-along at Town Square. Enter the sweepstakes. Actually, just by buying admission this summer, you get entered into a sweepstakes to win one- and two-carat diamonds, a crystal Cinderella slipper, VIP access to attractions, and private tours, dinners, and overnight stays in the parks. Nab diamond-themed food and souvenirs. All summer long, you can buy shiny treats and merchandise to commemorate the Diamond Celebration. Try the sparkly anniversary cupcakes at the Jolly Holiday Bakery, or the beverages (sold all over) in containers that light up in concert with the new after-dark shows. In shops, more than 500 items will be Diamond Celebration-themed, including limited-edition ear hats, pins, mugs, and plates. Stay connected. On social media, use the hashtag #Disneyland60 to follow and post about what’s happening in any given moment. You can also check out disneyland.com/60 and disneyparksblog.com for the latest on the celebration. Explore outside the parks. The diamond theme will stretch beyond the park gates, adding sparkle and festivity throughout Anaheim’s Downtown Disney area and the Disney hotels. However you choose to wish Disneyland a happy 60th birthday, there’ll be copious amounts of joy and wonder involved.